GreatGold.fm iNetRadio is Streaming Classic Hits Again! FOR BIRTHDAYS see Main Menu above. Select JANUARY. IF YOU’VE BEEN TRYING to listen to GreatGold.fm internet radio using older directory listings of internet radio stations, or old settings on your player software, there’s a reason you haven’t been able to listen to GreatGold.fm internet radio. The listings and settings are likely outdated, because we’ve changed to a different streaming server, so, that means, our streaming address is no longer the same as before. So, the best way to make sure you can hear us is (1) use our player at our GreatGold.fm website, (2) go to Radionomy.com on the internet and enter “greatgold” in the search on the Radionomy website, or, go to Clik2Go.com to find the up to date WinAmp settings on the NetRadio page link on the Clik2Go website. THE HAPPY NEWS about getting our stream back online is kind of premature. We find we still have a bit more work with the changeover to go, but, WE ARE STREAMING. Getting links set up accurately on our website pages is taking a little longer than we would like. Our streaming is now being handled by Radionomy. The LISTEN NOW link on our pages now goes to a temporary solution during the transition that allows you to listen. Or, you can always hear our stream at RADIONOMY.COM by entering GREATGOLD in the Radionomy Search. Or, you can browse through the many listings that include other Radionomy members. We’re also on the Radionomy Mobile App (search for “greatgold” and make us your favorite, so you can always find us easily. ONE OF THE THINGS we have to work out involves the current temporary solution when you click on the LISTEN NOW button that takes you to our Audio Launch Page. We noticed that page is constructed in such a fashion that makes it NOT compatible with small monitor screens, such as mobile devices. The rest of our website have pages that are Responsive to the size of the screen they are viewed in. We prefer ALL of our pages are Mobile Friendly, as well as desktop, tablet and laptop computers. That’s just one of several loose ends we hope to take care of in the next few days. Thanks for being patient. IT’S ALSO TAKING a little time to get our music mix back into sync with what we’re famous for. That takes awhile when one uploads our extensive music library, of the best hits from the 1950s through the 2000s, from our old streamer to the new streamer at Radionomy. Then, after the music files are transferred, we must fine tune our Classic Hit Oldies artists and songs to the point where we’re satisfied we are bringing you an authentic taste of our special mix, every hour of every day, 24 hours, seven days and nights. HAPPY DAYS! After quite a bit of working at it, and a little help, the GreatGold.fm Classic Hit Oldies music stream is back to play on your computers, laptops and phone apps. It’s easy to get connected to the Best Oldies on The Internet. On our website, click/tap on LISTEN NOW. There is a link in our main menu and a button in our sidebar. 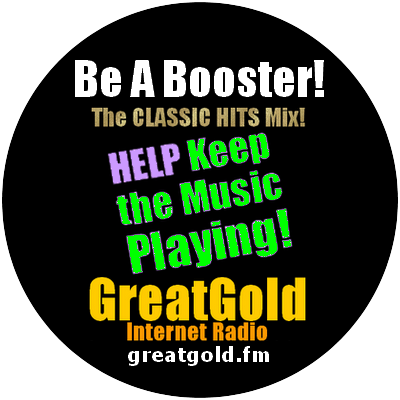 Click or tap to go to our Audio Launch Page and GreatGold.fm, the Classic Hits Mix! 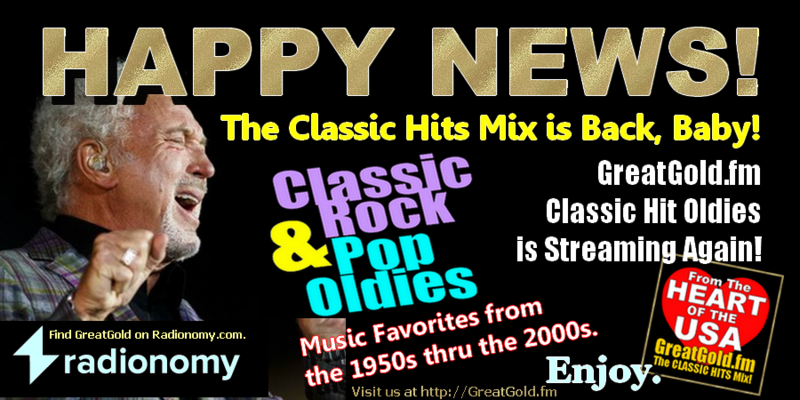 We’re your internet radio station with the best hit favorites from the 1950s thru the 2000s! UPDATES: KEEP CHECKING THIS PAGE for updates during the next few days. We’ll do our best to keep you informed. Thank you.